It's a Scrappy World: Where have I been? It's Christmas Chaos at Bugaboo Stamps!! Where have I been? It's Christmas Chaos at Bugaboo Stamps!! I'm just giving my followers a brief explanation for my absence on my blog the last several months. In late August or early September, I ruptured the tendon in my hand and have been out of commission and on leave from the Bugaboo DT. I have so thoroughly missed working with my beloved Bugaboo Stamps Design Team, and seeing all of your wonderful comments, that I have decided to return to my team and to blogland. I hope you will be patient with me as I transition back, despite not being 100% healed yet. To those of you who have already known of my situation, thanks so much for your kind words and continued prayers. I am hoping to eventually regain total use of my hand. Bless you all! 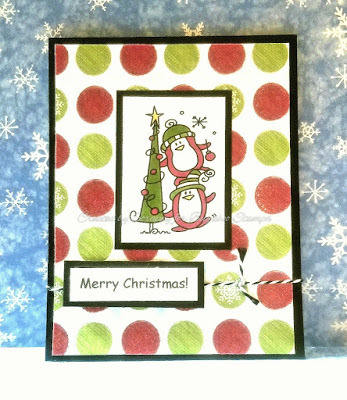 Today, I want to share my project for Bugaboo Stamps weeklong annual celebration known as Christmas Chaos! Our challenge today is for you to create something for our theme of Merry and Bright! That's right! So break out the glitter and glitz, get creative and post your creation HERE! I hope you like my sample below featuring this Bugaboo Stamps cutie called Little Penguin Decorate Tree! Please leave your comments below after checking it out and be sure to check out the creations from my fellow DT friends at the Bug Blog as well! Your card is adorable. Love the bright colors and the bright paper. Beautiful card and welcome back to blogland!! Thanks for joining the Kraftin' Kimmie Stamps challenge! What an adorable Christmas card. Thank you for joining us at The Merry Christmas Challenge blog!! Darling card Scrappy. I love the Bugaboo images.. of course. and so glad you shared over at Craftaholics R Us. Your card is fantastic. So sorry to hear about your health i do hope you are fully healed soon. Crafty Gals Corner Challenges . Beautiful festive card!Super cute!Thank you for joining our challenge this week at the Crafty Gals Corner!Hope you join us again soon!